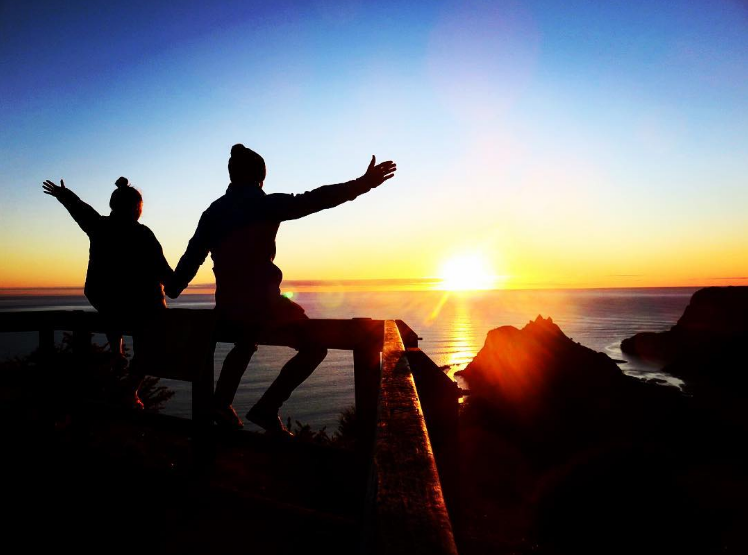 With some of the world’s most picture perfect, stunning scenery and so much to see and experience, it’s no wonder New Zealand has become a favourite for backpackers planning a gap year abroad. So what’s the best way to explore it? 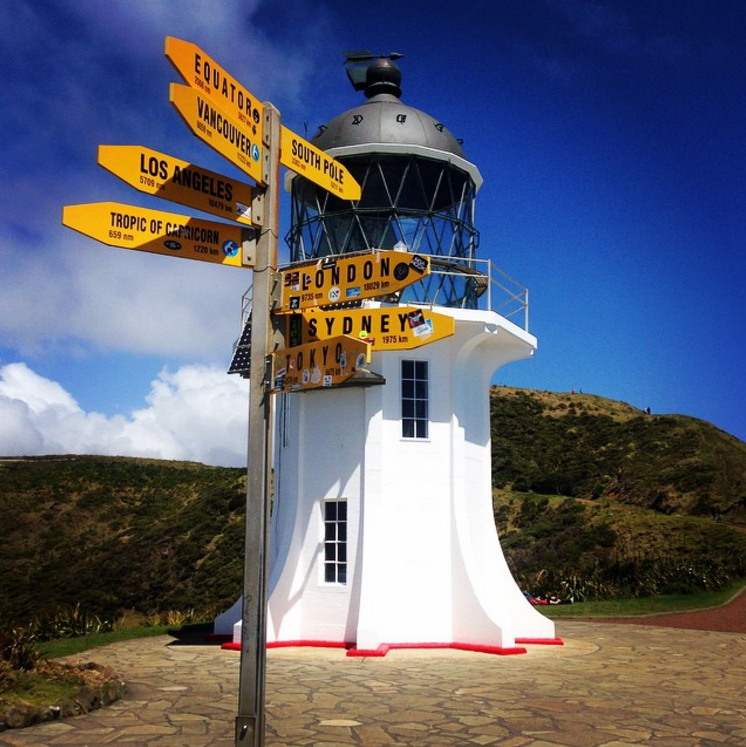 There are heaps of ways to travel around NZ including guided group tours, hop-on, hop off bus passes and renting your own car or camper. How you travel around will depend on how much time you have to travel, your budget and what you want to get out of the experience. 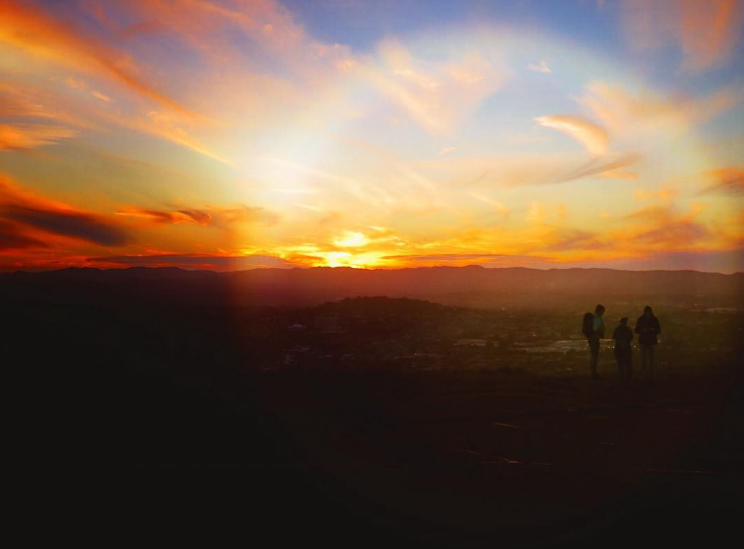 Our travel experts have been there, done that so get in touch for help and advice deciding which option is right for you and some inside tips on travelling around this beautiful country! 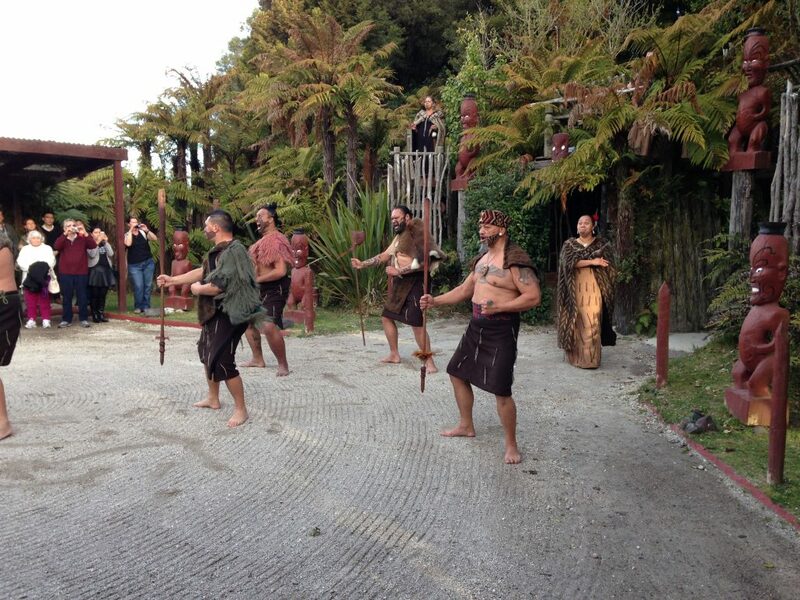 Our New Zealand adventure started in Auckland. Here, we visited the famous Skytower, offering panoramic views of the city and of course we headed straight to try out the Belgian beer pub! To work off some of the beer, we went mountain biking in Woodhill Forest and got an awesome vantage point of the city from one tree hill. 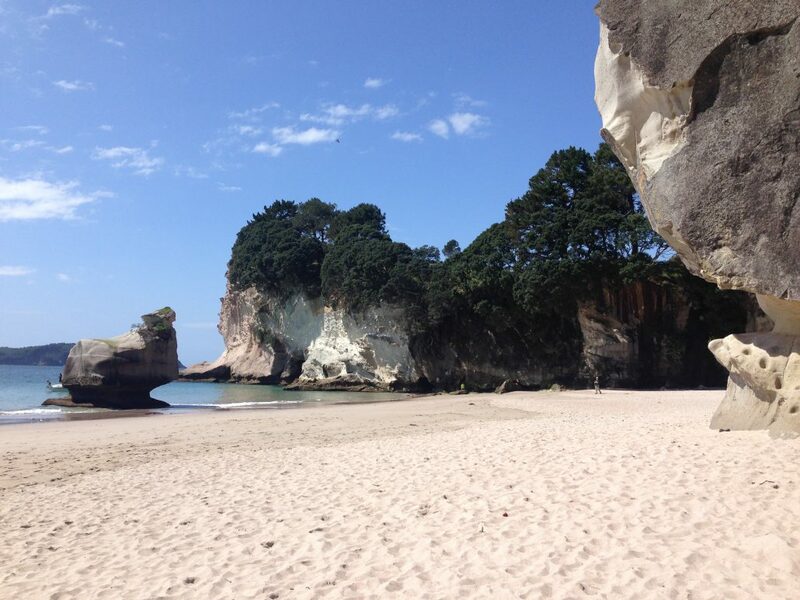 Then it was time to collect our camper and head to the Coromandel Peninsula. It was such a beautiful ride with different landscapes, sea and mountains. 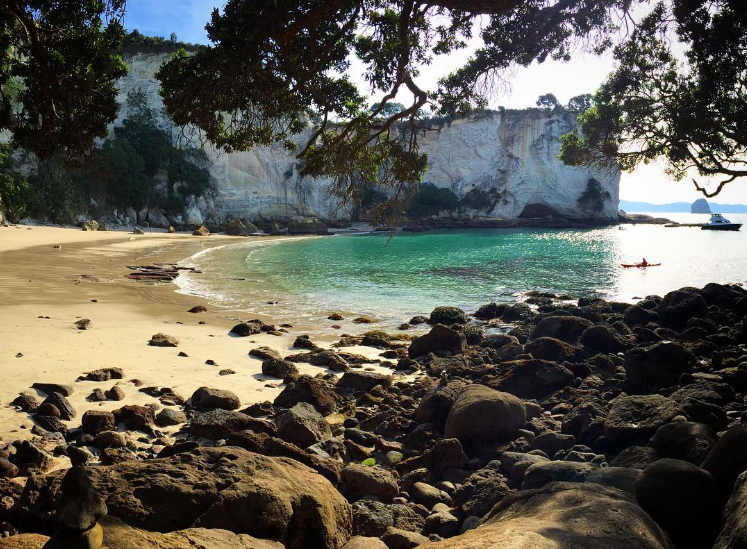 Arriving at Hahei beach, we immediately set up our BBQ and cooked up some scampi. 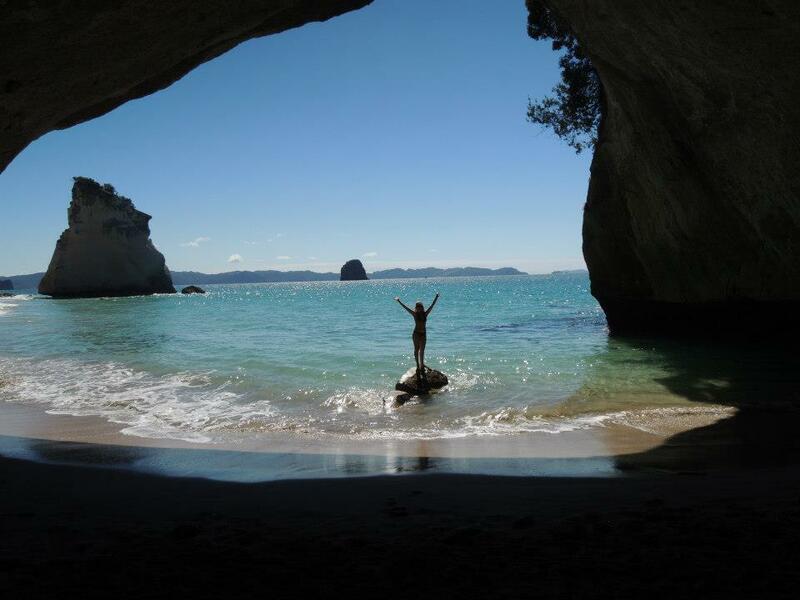 We hiked and explored some of the bays, including Gemstone Bay, Stringray bay and Cathedral cove is where the movie Narnia was filmed. Such a stunning spot! I’d been excited to head to Hot water beach where I’d heard you can dig your own jacuzzi in the sand using the hot springs beneath the beach! Next we drove to Rotorua where we checked out Waiotapu, an active volcanic area which was really impressive, although it did smell like rotten eggs! 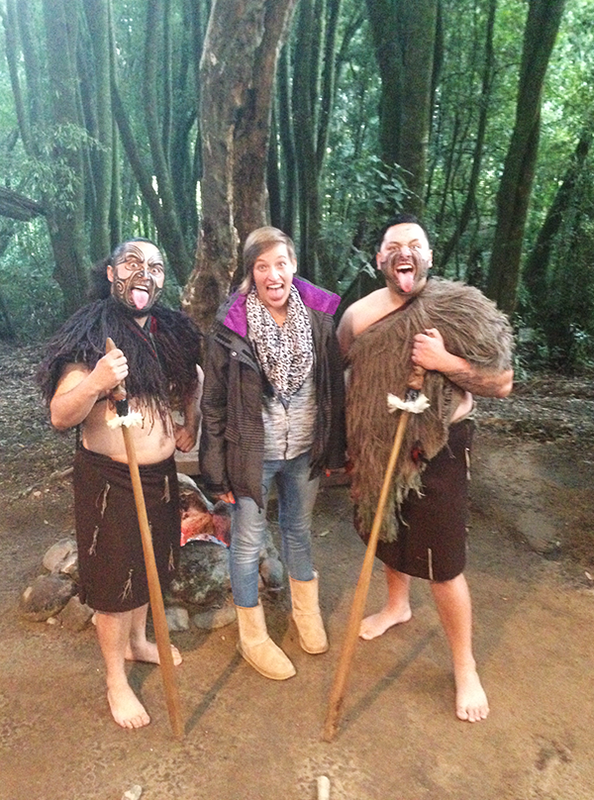 😉 Tamakei village was a great place to find lots of Kiwi souvenirs and learn about the very interesting Maori culture. 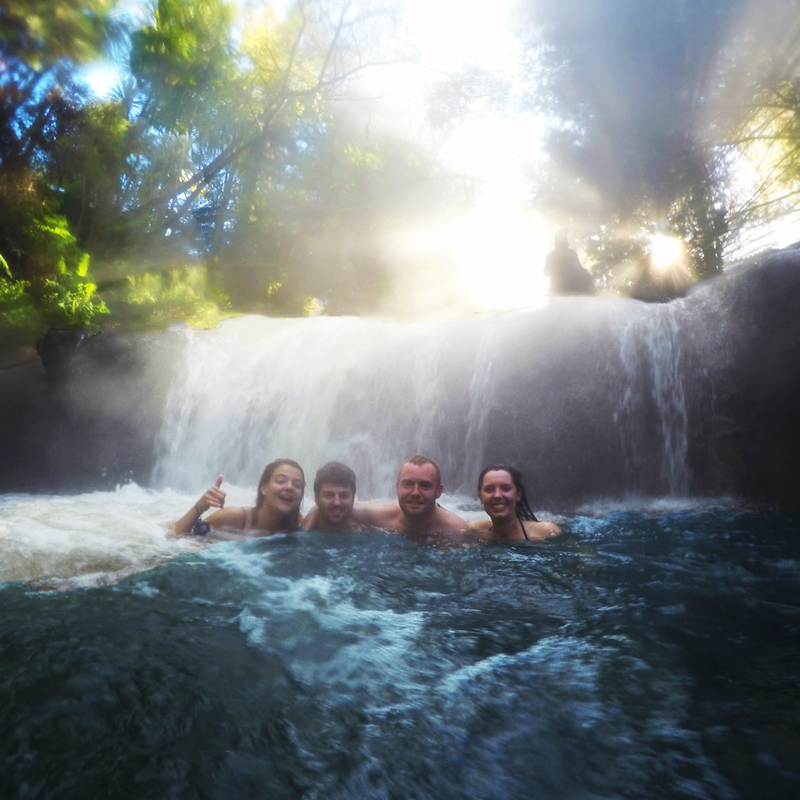 Next it was time to drive to Taupo, stopping on the way to check our Hukka falls with incredible blue water. It’s a pity we didn’t have more time, as I would have liked to see more of the river. 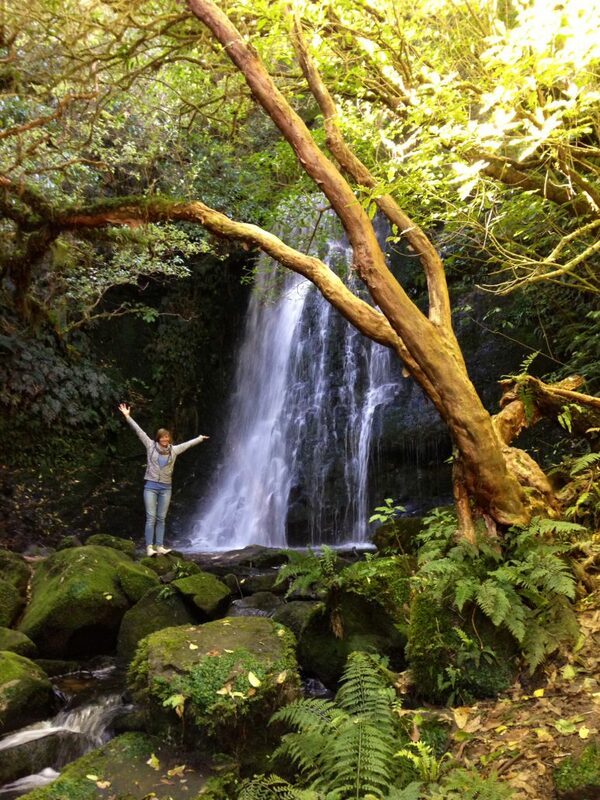 Next stop: Tongariro National Park where we found amazingly beautiful snowy mountains and some impressive waterfalls. 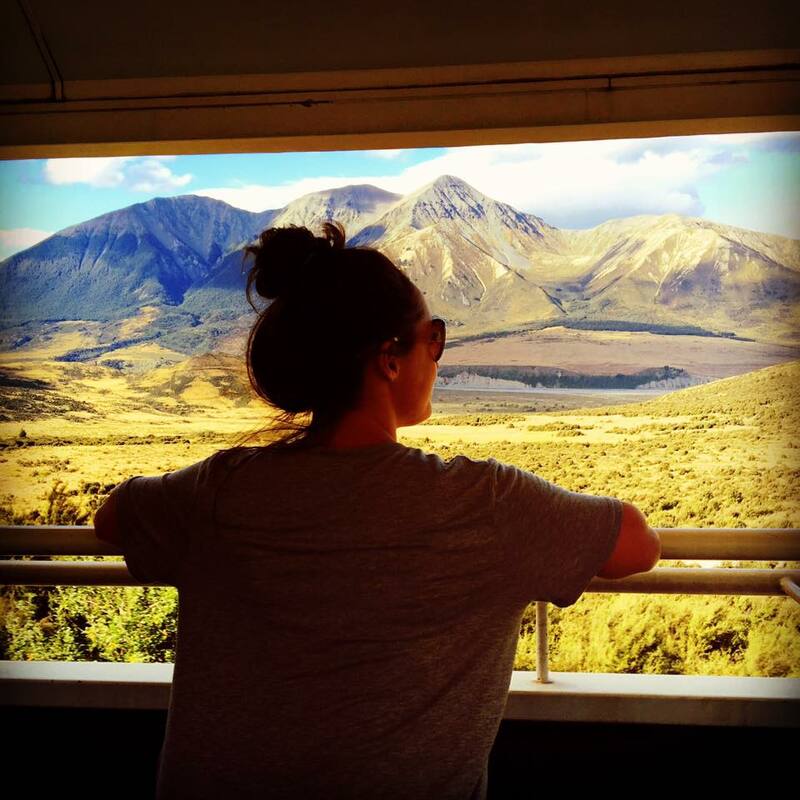 We hopped on the ferry in New Zealand’s capital, Wellington and started our short ferry journey over to New Zealand’s South Island. 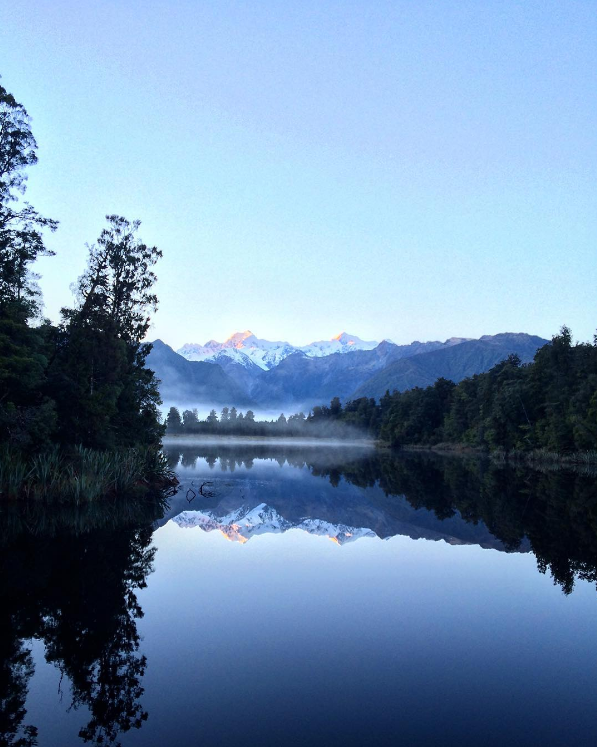 When we arrived, we immediately noticed a big difference between the North and South Island. Here, we came across lots of mountainous, beautiful greenery and lots of sheep! 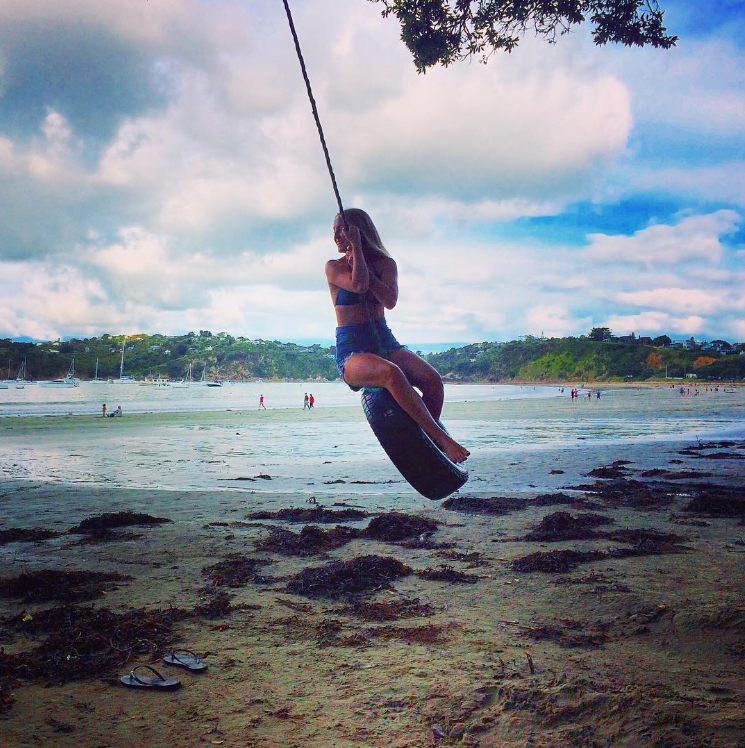 Okiwi bay in the Abel Tasman National Park was one of my favourite memories of my time in the South Island. We took a lovely walk along the coast which was literally just us…and some sea lions chilling on the beach! It was so quiet and some of the (massive!) sea lions came right up to us to say hello – definitely a memorable experience! Afterwards, we climbed up to the summit to take in the breathtaking views of the national park. All in all, a TOP DAY! 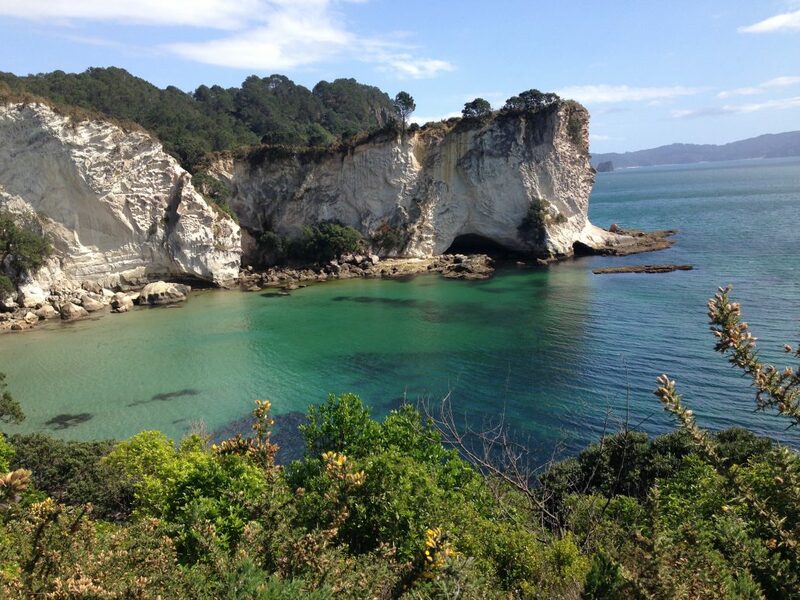 We said goodbye to the beautiful Abel Tasman and continued our journey on to Christchurch. This place had been on my bucket list for a while! I’d heard a lot about the beautiful town and was intrigued to visit somewhere that had been hit by an earthquake. It was so interesting and of course sad to see how it affected the city. We visited some museums and explored some of Christchurch’s gardens before driving back to the coast to start our journey down the Peninsula banks. Another beautiful ride with incredibly beautiful views! As soon as we arrived at Lake Tekapo, I immediately fell in love with the area: a beautiful lake surrounded by mountains. We parked up our camper by the lake and spent the day chilling and admiring the views. 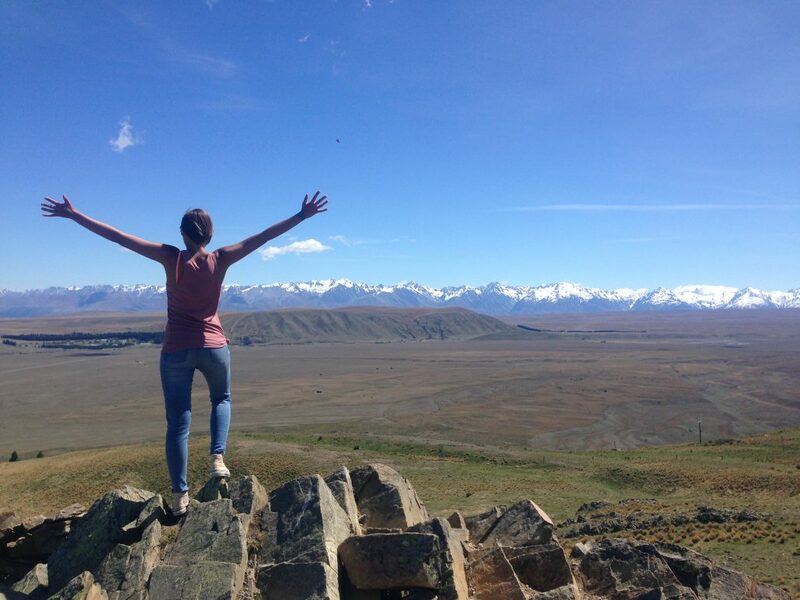 The next day we climbed up Mount John and spent a few hours taking in the amazing views before enjoying our last day of sunshine and hot pools in Tekapo. A much needed few days of chilling in a stunning area before travelling on. 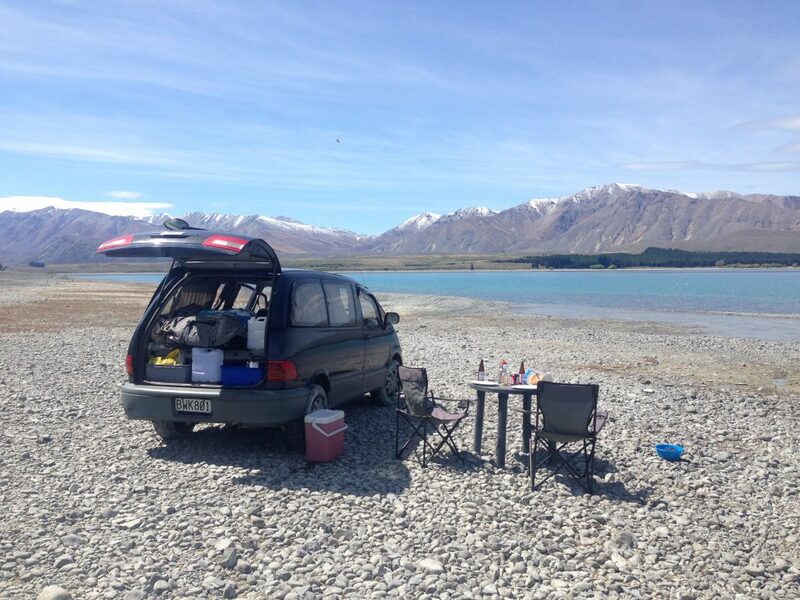 Time for Mount Cook, but before we got there we made an stop at Lake Pukaki. It was quite overcast so we decided to make a hike to Mount Cook and drive to Oamaru in time to catch the sunset and to see a colony of blue penguins waddling ashore to settle on the beach for the night – so cute! 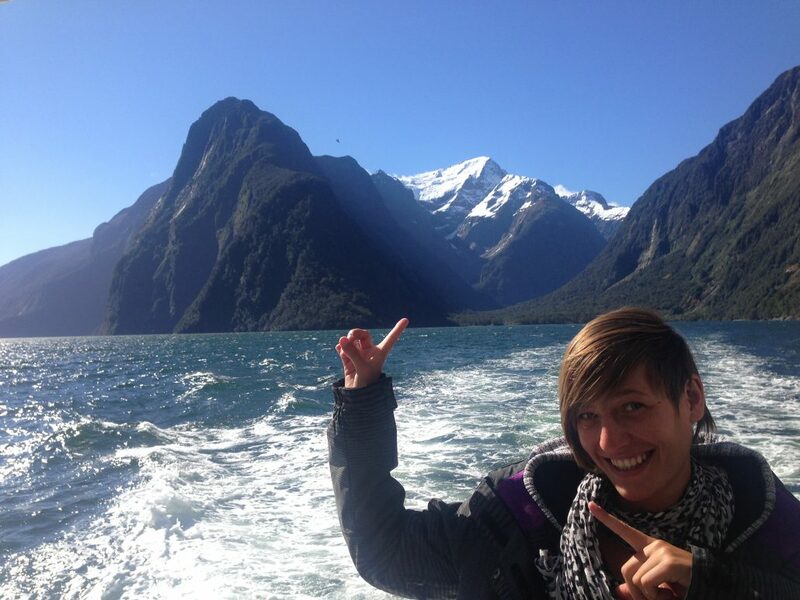 Now time for the Milford Sound which also turned out to be one of my favourite places here in New Zealand. The sound, surrounded by majestic mountains is one of the most beautiful places I’ve ever seen – some of the stops will leave you speechless! We hadn’t planned on doing a boat cruise but were so happy we did in the end – it’s really beautiful! On the way back we stopped off at a waterfall to re-fill our water bottles – yep, the water was the purest I’ve ever tasted! 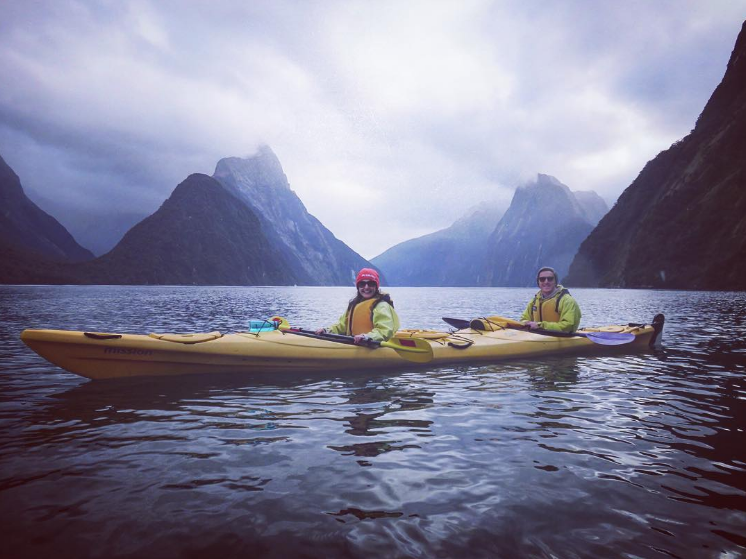 Milford sound – you were incredible! 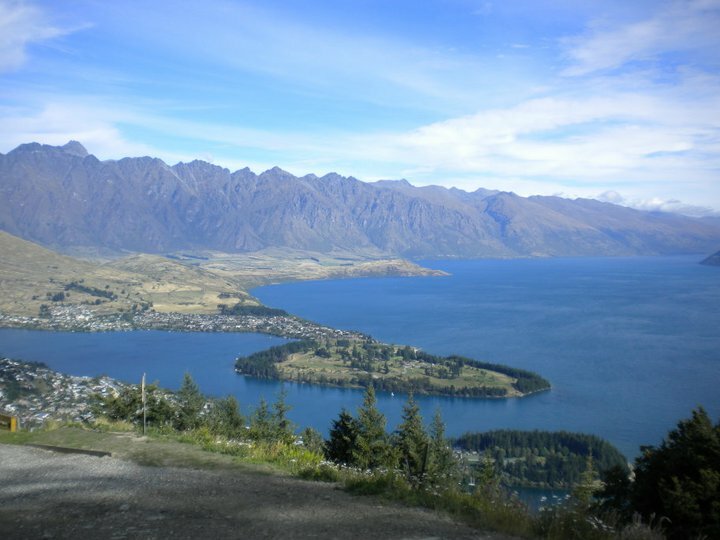 From there we drove straight to Queenstown where we spent a few days in a hostel living in backpacker luxury – a welcome short break from our campervan! We spent most of our time exploring the town and the beautiful lake surrounding the town. 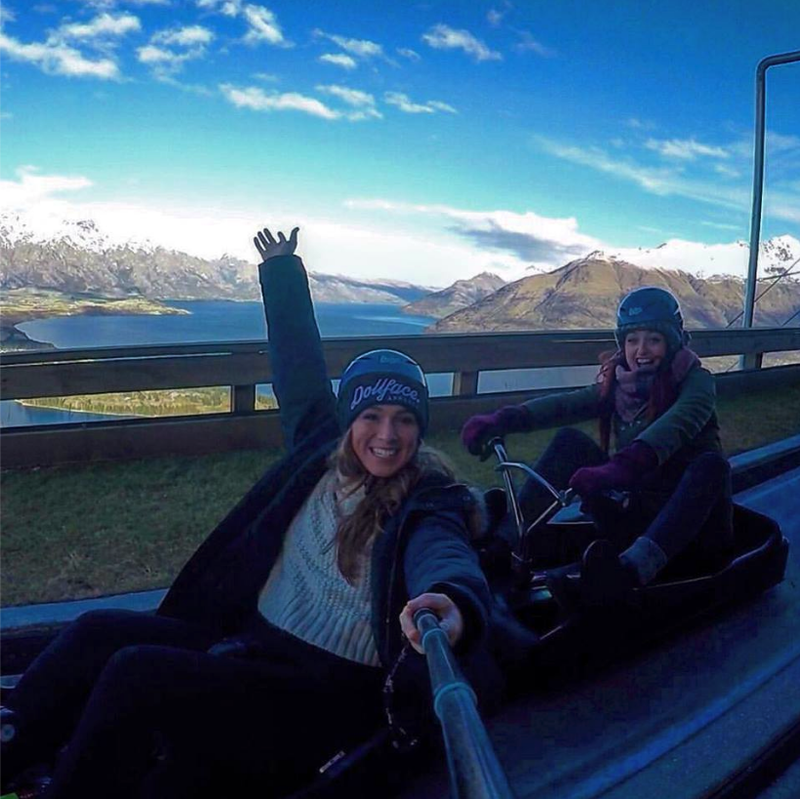 We went to an ice bar, checked out some of Queenstown’s pubs and of course, tried the famous Q’town Fergburger! Next I did something I never thought I’d experience…a bungee jump! 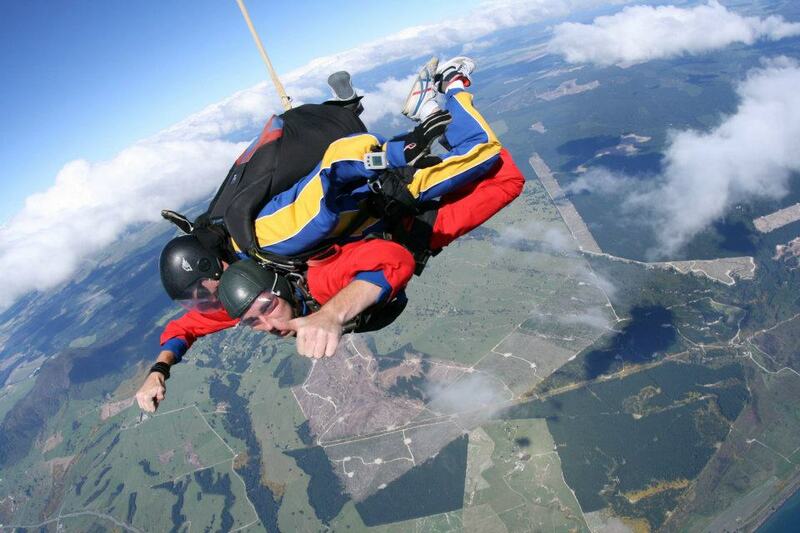 Of course, I had to book myself onto the biggest bungee jump in Australasia, the Nevis bungee jump at 136 metres! I stood on a small platform between two mountains with the river below. Of course I was super nervous, but I really didn’t have time to think! Before I knew it…3…2…1…JUMP! WHAT AN EXPERIENCE! 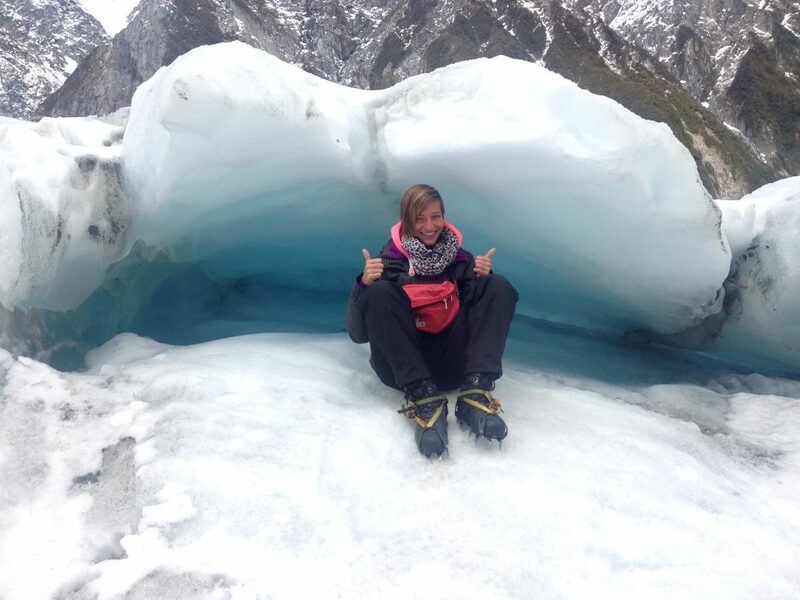 The next day I continued to conquer my fears with a Franz Joseph Glacier helicopter tour! 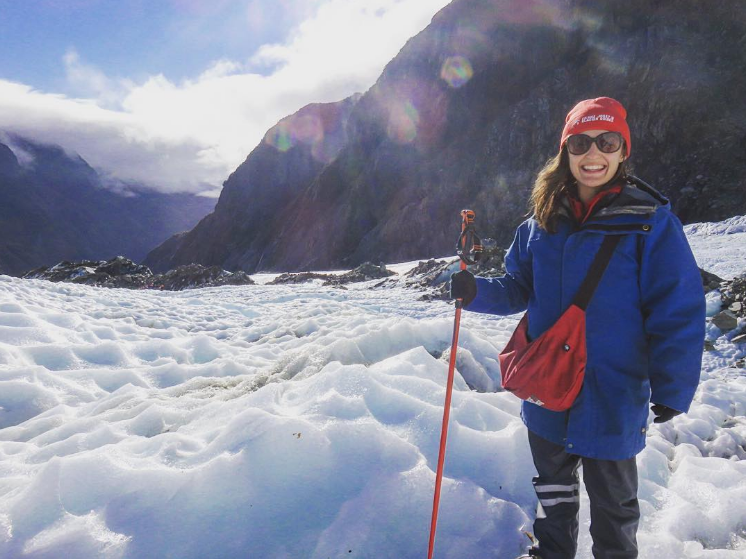 We hiked through the Glaciers which was an experience I’ll never forget – I still can not believe we did knowing that this beautiful place won’t be here in years to come! Crawling between icebergs, and hiking in the glacier was just fantastic. Photos don’t do it justice or show just how big it really is! 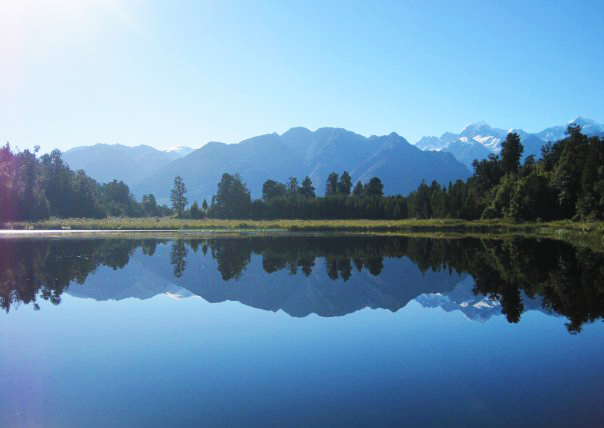 We also got to check out Lake Matheson, New Zealand’s mirror lake – a small lake where you could see the reflections of the mountains in the water. Another amazingly beautiful lake! 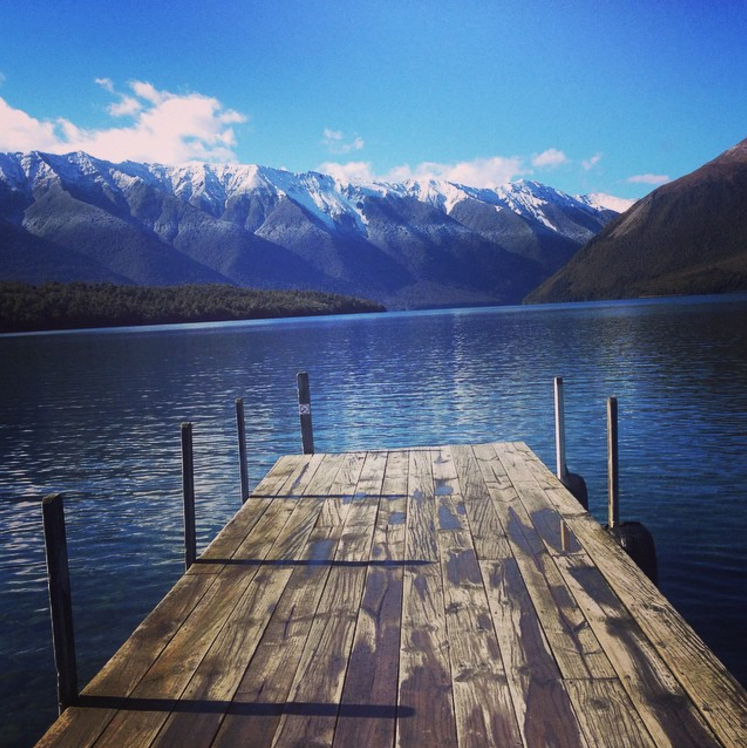 We’re almost at the end of our time in New Zealand: last stop is Lake Nelson! The lake is beautiful and you can drive all the way to the top to enjoy the stunning views. From there we then drove to Abel Tasman and back to Auckland where it all began for a few more days of fun in the beautiful North Island. 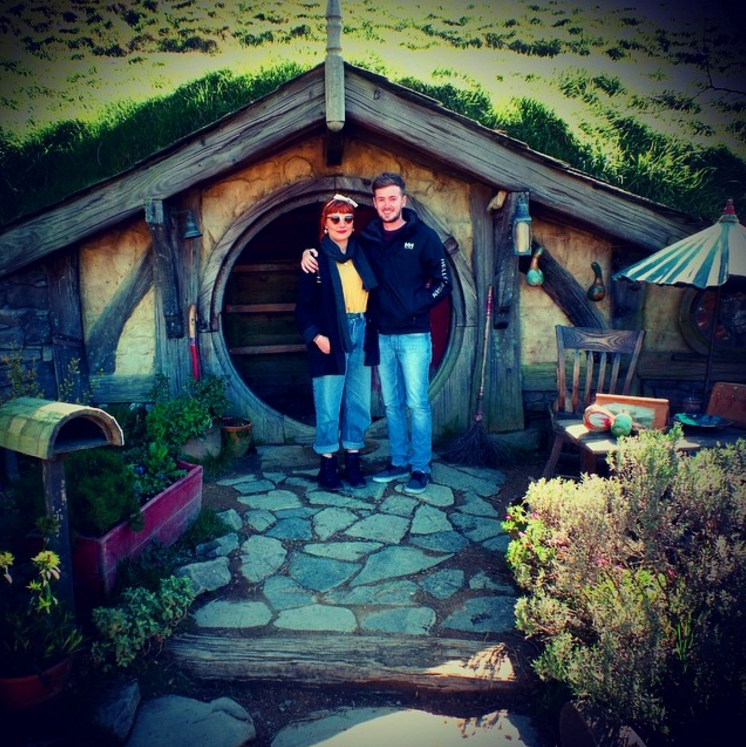 Overall I loved my time in New Zealand and fell in love with the country and the people we met along the way. I can’t wait to go back and experience more! 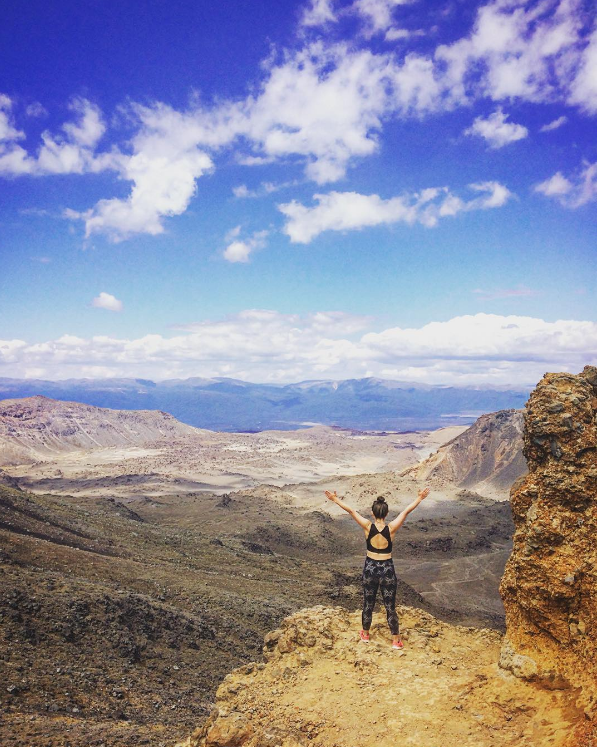 My Travel Moto: Don’t let your dreams be dreams! 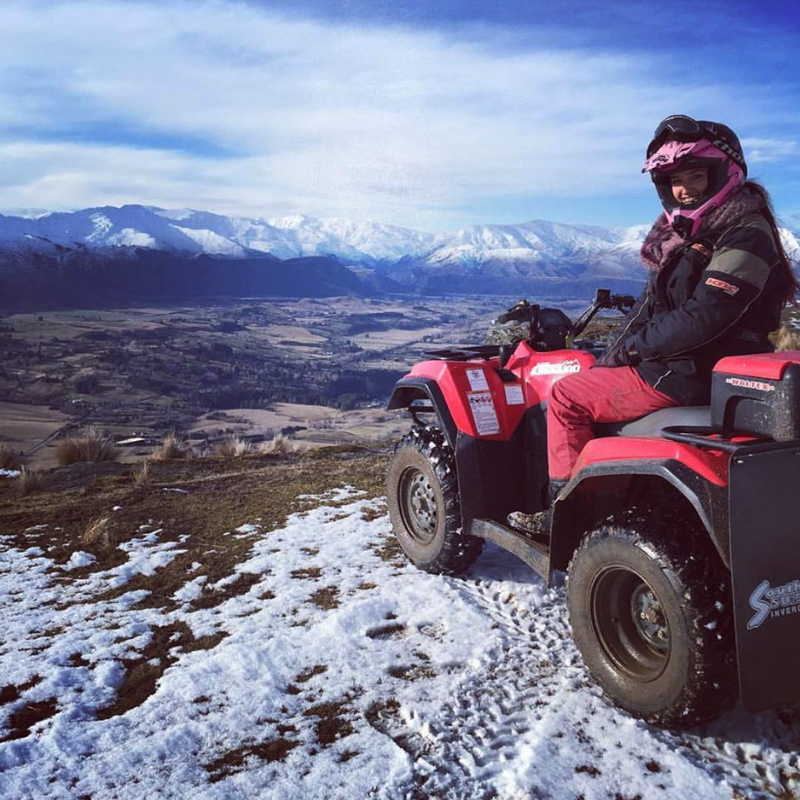 Time for your New Zealand adventure? 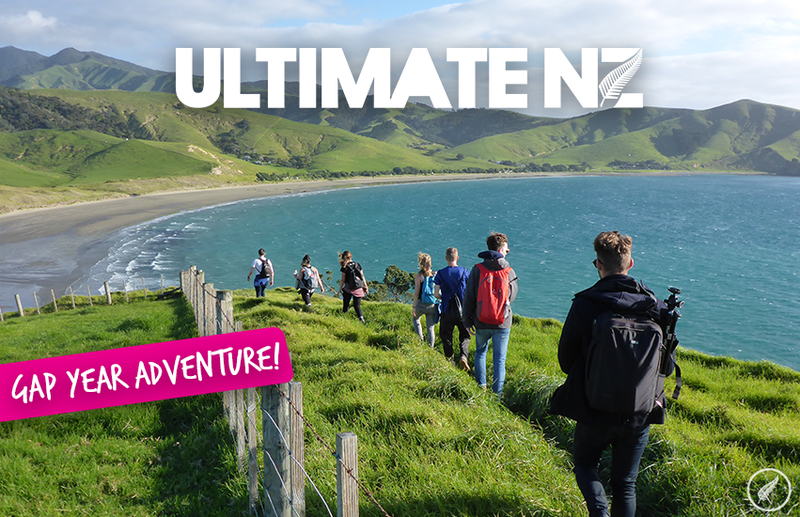 Why not kick start your gap year with Ultimate NZ, giving you everything you need to get set up in NZ along with travel discounts and a week of fun activities and exploring the stunning Coromandel Peninsula! 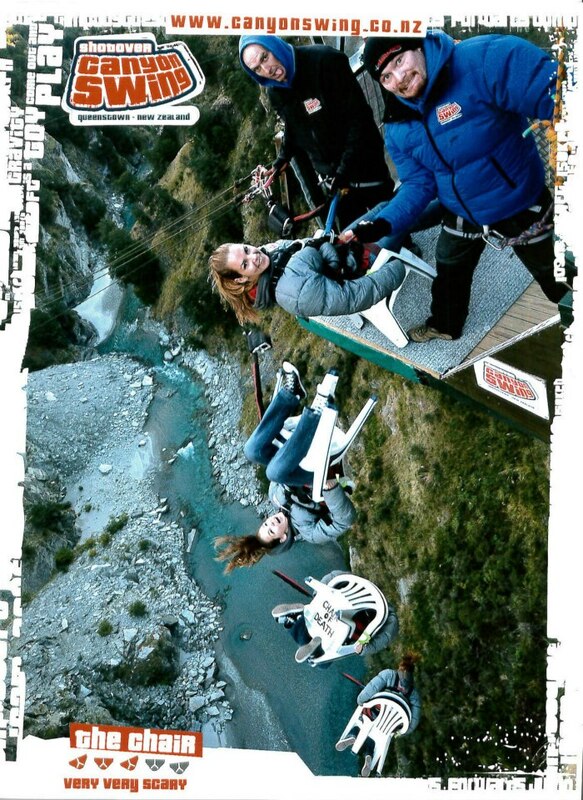 Download your free Ultimate New Zealand brochure today!